The last of us, Ph.D. I hear tell that there’s another movie in the Alien franchise in theaters, which makes this a fine opportunity to revisit the beauty and stupidity of the last one, Prometheus. In that previous instalment, we watched people who were, allegedly, some of Earth’s greatest scientific minds blunder their way into an alien bio-weapon storage facility only to get eaten by and/or mutated into horrific H.R. Geiger-designed monstrosities. 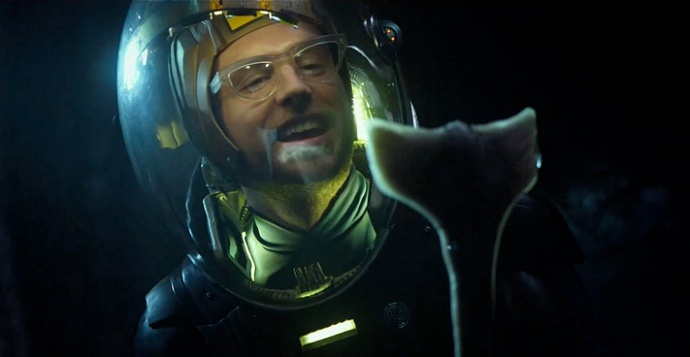 The behavior of the Prometheus team’s biologist Rafe Millburn is a regular joke on Science Twitter even without millions of dollars of studio marketing to remind us about it — he infamously reaches out to a hissing alien snake-thing that promptly breaches his spacesuit and kills him. Recently, though, that regular discussion landed on an important question arising from poor Rafe’s bad example: what kind of field scientist would do better than the Prometheus team? Archaeologists. Strengths: Contrary to many popular depictions, archaeologists are good at approaching and exploring mysterious ancient ruins without disturbing them. Weakness: Contrary to the same popular depictions, they do not actually have any experience in dodging elaborate booby traps. Anthropologists. Strengths: Expertise in cross-cultural understanding and communication, which will help in understanding alien artifacts or actually making First Contact. Weaknesses: That skill set is useless against indestructible parasitoid killing machines. Microbiologists. Strengths: These folks are the most likely, of anyone on the list, to have heard about the planetary protection protocol, which requires measures to prevent contamination of other planets by terrestrial microbes — measures that also conveniently protect terrestrial explorers from alien microbes that turn their victims into killer xenomorphs. They’ll know the lab techniques necessary to safely study a microbial threat if it does turn up, too. Weakness: You can’t run for your life and use a compound microscope at the same time. Geologists. Strengths: Geologists will certainly have the best map-reading and -making skills on this list, can find water (which maybe a microbiologist should test before you drink it), and can locate valuable minerals to justify the interstellar expedition in the first place. They also carry tools that can double as weapons in a pinch, like rock picks. Weakness: Having found those valuable minerals, they’re the most likely to argue that you ought to stay on the planet and tough it out when it’s past time to evacuate and nuke the landing site from orbit. Paleontologists. Strengths: Extensive knowledge of comparative anatomy will help in identifying threats from organisms no human has seen before. Weakness: They’re used to identifying threats that haven’t moved under their own power in millions of years. Ornithologists. Strengths: Dedicated birders often have well-tuned senses of hearing and excellent experience with camouflage — and ornithologists are among the few people on this list (alongside anyone working in the Arctic) who may actually use firearms in the field. Weakness: They’re prone to standing around trying to resolve ambiguous field marks when they should be fleeing to the safety of a fortified base camp. Botanists. Strengths: Botanists know how to safely handle organisms that grow eight-inch spikes, secrete irritating oils, or contain any number of exotic toxins — and, in a pinch, how to identify or cultivate edible plants for food. Weakness: They’re used to working with organisms that can’t outrun them. Entomologists. Strengths: Entomologists are the kind of people who can systematically test and describe the pain of ant and wasp stings and aren’t panicked by the odd bot fly larva. Weakness: Entomologists are the kind of people who’ll let ants and wasps sting them and leave bot fly larvae burrowing through their flesh out of curiosity. Marine biologists. Strengths: Experience in vehicles, facilities, and equipment that most closely approximate what you’d actually use on a trip to a different planet. Familiarity with a wide variety of organisms, from algae to vertebrates, that thrive in extreme environments and stretch the limits of human experience. Weaknesses: They’re the team members most likely to have smuggled along a stock of booze, so they’ll be blind drunk and singing chanties at the campfire when the xenomorphs attack. To be fair, there are worse ways to go. This entry was posted in fieldwork, just for fun, modest proposals and tagged science fiction. Bookmark the permalink.